It was mostly mayhem outside the theater. My brother and I were trying to meet up with our compatriot, and it was taking longer than it should. There were tons of people hunting for tickets – looking for a miracle, as they say. I’ve never seen so many heads looking for tickets. For good reason. The marquee read Happy Birthday Phil. 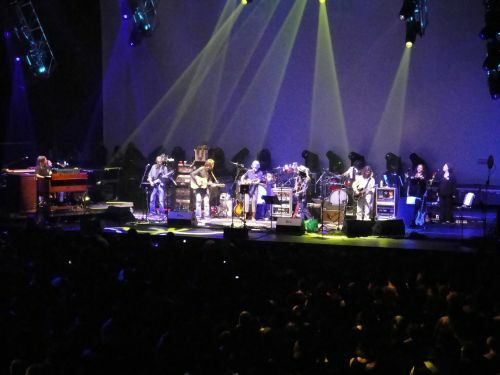 It was Friday, March 12, and a big birthday party for Phil Lesh was about to get under way at the Bill Graham Civic Auditorium in San Francisco. Phil Lesh was turning 70. 70! And believe it or not, he and his bandmates played over six hours of music that night. The show was billed as Furthur & Friends. This suggested that there would be special guests. And there were. A whole bunch of veterans of Phil & Friends tours made appearances. Chris Robinson (Black Crowes) and Jackie Greene were the featured vocalists. They were both great, delivering passionate vocal interpretations of all the songs they sang. Jackie played guitar throughout the show, both rhythm and lead, and Chris picked up his guitar for a few songs, too. A few other Phil & Friends folks – Steve Molitz and John Molo – came in at various points, too. They did three sets, playing for more than 6 hours combined. Each set had a slightly different line up, and the first was an acoustic set. The highlights in the first set for me were Brokedown Palace and A Hard Rain’s a-Gonna Fall, but all the songs were great. Brokedown Palace has a real gospel energy to it, reinforced by the back up singers and Jackie Greene’s vocal interpretation of the song. That gospel energy is part of the song, but they give it a real presence here. It’s getting a lot of listens in my iTunes. A Hard Rain’s A-Gonna Fall followed. It was the evening’s first Dylan cover, and Bobby tackled the vocals on this one. Nice. Unfortunately, I missed the first song of the night – Ripple – but I’ve listened to it since, and I’m upset I missed it. Check it out. With Jackie and Chris on board, the harmonies are nice and richly layered. The third set is notable not only for all the great songs – including Phil’s magnum opus Unbroken Chain and Franklin’s Tower – but also for the Parade of Floats during Not Fade Away, a happy birthday to Phil with a balloon drop, and a couple of go-go dancers during Cream Puff War. It was just an amazing show. One that will be remembered for its uniqueness, length, and great chemistry and delivery by the band. Go listen to it at the Internet Archive and see if you agree. I think you will.